Harpers Ferry National Historical Park of West Virginia is the newest national site honored on a large format silver coin now available from the United States Mint. Struck from five ounces of .999 fine silver with a diameter of three inches, the collectible is the third 2016-dated release from the U.S. Mint’s program of America the Beautiful Five Ounce Silver Uncirculated Coins. 2016-P Harpers Ferry Five Ounce Silver Uncirculated Coins arrive encapsulated, set inside a protective outer box and come with a United States Mint Certificate of Authenticity. The coin is the 33rd in the program overall, and the third issued in 2016. It launched on Thursday, July 14, at noon ET. Harpers Ferry National Historical Park has played an important role in history; even before its establishment as a national park. Its position as a passage area of the Potomac through the Blue Ridge Mountains insured its importance, becoming one of the first industrial centers of the nation as well as a site of important military events. Featured on the coin’s reverse is John Brown’s Fort, the site of his last stand during his raid on the Harper’s Ferry Armory. The design was created by United States Mint Artistic Infusion Program (AIP) artist Thomas Hipschen with sculpting completed by United States Mint Sculptor-Engraver Phebe Hemphill. 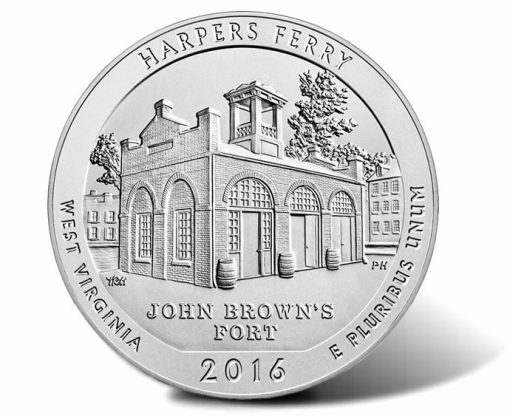 Shown is the reverse or tails side of the 2016-P Harpers Ferry National Historical Park Five Ounce Silver Uncirculated Coin. It features John Brown’s Fort. Inscriptions around the design read: HARPERS FERRY, WEST VIRGINIA, 2016, and E PLURIBUS UNUM. If the coin image looks familiar, it is because it was also used for the Harpers Ferry quarter released earlier as part of the U.S. Mint’s America the Beautiful Quarters® Program. 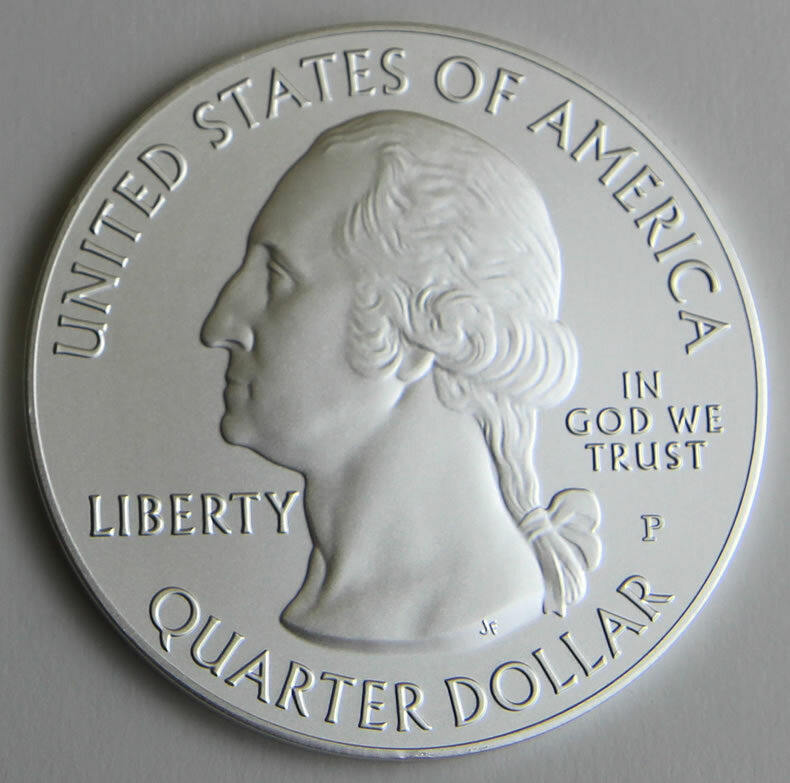 Also, and like that quarter series, the silver coin’s obverse shares the basic portrait of George Washington, the first President of the United States. The effigy was created by John Flanagan. Here is a photo of the obverse or heads side of an America the Beautiful Five Ounce Silver Uncirculated Coin. The design is shared across the series, just on companion quarters. Shared inscriptions include: UNITED STATES OF AMERICA, IN GOD WE TRUST, LIBERTY and QUARTER DOLLAR. In addition, a ‘P’ mint mark appears to the right of the effigy, which indicates the coin was produced at the U.S. Mint’s facility in Philadelphia. Finally, an edge inscription completes the designs, reading .999 FINE SILVER 5.0 OUNCE to denote the content and size of each collector coin. 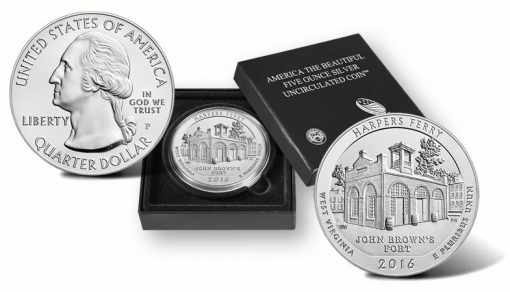 Priced at $149.95, the 2016-P Harpers Ferry National Historical Park Five Ounce Silver Uncirculated Coin is available from the U.S. Mint on this product page or by calling 1-800-USA-MINT (872-6468). The U.S. Mint also produces a bullion version that is intended for investors. 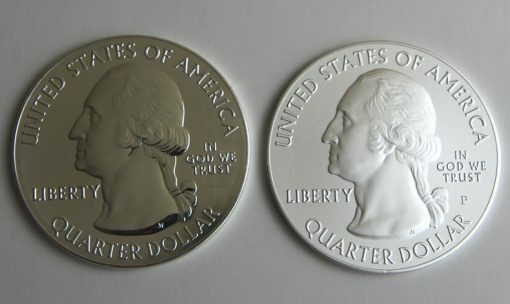 Specifications for bullion editions are nearly identical to the uncirculated coins. The two major differences include their brilliant finish and a lack of a mint mark, although they are also produced at the Philadelphia Mint. Here is a photo of obverse sides of America the Beautiful Five Ounce Silver Coins. A bullion version is left and a collector uncirculated edition is right. The collectible coin bears a ‘P’ mint mark below ‘IN GOD WE TRUST’. The Harpers Ferry bullion coin launched on June 7 and has sales of 34,200. Bullion coins are also not sold directly to the public as the U.S. Mint reserves their selling to authorized distributors who buy them in bulk. They pay a premium of $9.75 per coin above spot, then resell them to coin and precious metal dealers and the public for a small amount over their melt value. I’m really quite surprised at how few bullion versions of this coin have been sold. I don’t purchase the bullion versions myself, only the “P” versions. I wonder if this will also reflect in the “P” versions? I think the design of the coin and story behind this coin is really great. I would have thought it would have been a big seller. I cannot figure out what makes some coin designs more attractive for buyers than others. Ones I swear would have been dogs turned out to be big sellers. Happy collecting Jp & everyone else! I agree. Go figure? I think the SP versions are better looking also. I also noticed that there have not been any sales of the others lately too. That is how the Mint’s bullion coin Authorized Purchaser program has worked since the law was passed in 1985 for the silver & gold American Eagle coins that were first issued in 1986 (& for platinum in 1997). The strict requirements are necessary to provide a pipeline for distribution & a two-way market for the bullion version coins. You just have to shop around for the best price. There are only 13 worldwide US Mint Authorized Purchasers (9 in USA, 2 in Germany, 1 in Japan & 1 in Luxembourg). If you aren’t purchasing from one of these 13 companies, you are not getting the best price! They have plenty of available stock to sell purchased at lower cost, and marked way up to reflect rising spot prices. There is no reason to buy now. But there will be a crunch if silver does not back off. Then they are faced with adding new stock that would have to be marked up even more, facing retail buyer resistence. If silver gets back up above $25 then you see the market flooding with pawn and payday places rushing in to melt product in competition with commercial bullion. Thats interesting. Im only familiar with APMEX. I dont buy much of anything from them as (most) times I find better prices elsewhere. But they do have a terrific assortment of product. I will have to look those other ones up to see if they sell directly. Thanks for the list of dealers. I was going to ask the same question Jp asked. I guess a lot of us coin collectors think the same and want to get the best products at the best price. I like this design and plan on getting one. And now with the list of dealers I’ll be able to get it at the best price. Glad to help with info. guys. I received the official list directly from the US Mint’s Disclosure Officer since I had never seen the whole list in print anywhere. It is interesting that there are only 13 companies in the program & 4 of them are overseas. Good luck in your comparison shopping.